This small, fleet footed, meat eating Dinosaur is arguably one of the most important Dinosaurs in the history of paleontology. Its no exaggeration to say that this little chap helped change the way we looked at Dinosaurs in general and finally cemented the idea of Birds being the direct descendants of Dinosaurs in popular culture. It was a highly intelligent and sophisticated predatory animal. What it lacked in size and power it more than made up for in intelligence and speed. Though there have been some conflicting theories on how this animal lived and hunted, it is agreed that whatever the case this was a formidable predator and one of the most advanced Dinosaurs in terms of intelligence. Deinonychus lived during the early Cretaceous period 115 – 108 million years ago. It shared its world with other giant plant eating dinosaurs like Tenontosaurus. It was a relatively small carnivore by Dinosaur standards at least. It could each a maximum of just over 11 feet long and was a little over 2 feet tall at the hips. It was a member of the Dromeosaur family, a group of small meat eating Dinosaurs that also included the likes of the famous Velociraptor. It shared many similarities with other Dromeosaurs and modern day birds such as hollow bones, a wish bone and feathers. Though no skin impressions have been found of Deinonychus it can be safely assumed that it had feathers due to the fact that its closest relatives all possessed them. Outdated reconstruction of Deinonychus with a modern one. Deinonychus like many other Dromeosaurs had a massive cycle like claw on its foot, though the exact way this claw used used in tackling prey is a matter of debate. It also had long forearms with long claws and powerful jaws, with a bite force greater than that of any living mammalian predator that could have bitten through bone. In addition to this Deinonychus would also have been a very intelligent animal. Though its intelligence still most likely would not have been comparable to say modern mammals it would have still been on a par with many avian species. The first Deinonychus fossils were discovered in 1931 in southern Montana by Barnum Brown who named the animal Daptosaurus. More complete remains would be discovered by John Ostrom in the 1960’s, during which he renamed the animal Deinonychus Antirrihopus. Deinonychus means “Terrible Claw”. Whilst it is accept that Deinonychus was a vicious predator there is some debate about how it killed its victims. Originally it was believed that the animal used its sickle like claw to disembowel its victims alive. Many also believed that it hunted in packs. John Ostrom believed that this way Deinonychus despite its smaller size could hunt giant Dinosaurs including Ceratopsians and Tenontosaurs. Images like this of Raptors descending on their victims like a pack of wolves have embedded themselves in popular culture, but sadly it appears that this would not have been possible. Biomechanical reconstructions of a Velociraptor claw for the 2005 Docu The Truth about Killer Dinosaurs showed that its claw could not disembowel as it was smooth and designed only for puncturing. Further reconstructions also showed that the claw could not even have penetrated the skin of a small Crocodile without snapping. Deinonychus was larger than Velociraptor and therefore most likely would have been able to strike with more force. Still its unlikely that it would have been able to pierce the hide’s of giant Ceratopsian Dinosaurs. Added to that evidence that Deinonychus hunted in packs is not as strong as it once was. Thus it seems in all likelihood that Deinoynichus was not a predator of larger Dinosaurs. An exceptional fossil of a Velociraptor locked in battle with a Protoceratops may give an insight into how Deinonychus used that sickle like claw. The fossil in question is of a Velociraptor and a Protoceratops fighting with one another. How they died in this position no one knows, though it seems likely that they were buried perhaps by a sandstorm whilst fighting each other. Now when you look at the fossil closely you can see how the Protoceratops is using its jaws to clamp down on the Raptors arms whilst the Velociraptor is stabbing its sickle claw into its enemies neck. Some paleontologists have proposed that this is what the claw was used for instead of disembowling. It would thrust its claw into its victims neck and killed them by asphyxiation. There is strong evidence that Velociraptor dragged away and killed the babies of much larger dinosaurs like Ankylosaurus. This is shown in the final episode of Walking with Dinosaurs when two Dromeosaurs, relatives of Velociraptor and Deinonychus drag a baby Torosaurus away to its death. Thus considering they both are so similar then its perfectly reasonable to assume that Deinonychus would have done the same thing to its victims. A third theory has been proposed however that Deinonychus would have hunted in a manner similar to modern day birds of prey. It would have using the claw on its hands and feet scaled trees after which it would have glided down using its arms like wings onto the back of smaller plant eating Dinosaurs. The claws on its hands and feet would then have wrestled its victims to the ground after which it would then have used its jaws (which were more powerful than any Mammalian carnivore) to tear large chunks of flesh from its victims, until the blood loss and shock killed them. Whatever the case I think it can be agreed that death by Deinonychcus would be a very nasty way to go. Either you would get your stomach sliced open and your guts spilled out, your throat pierced and made to choke on your own blood or pounced on from behind pinned down with razor sharp claws and bitten over and over until you passed out and were eaten alive! 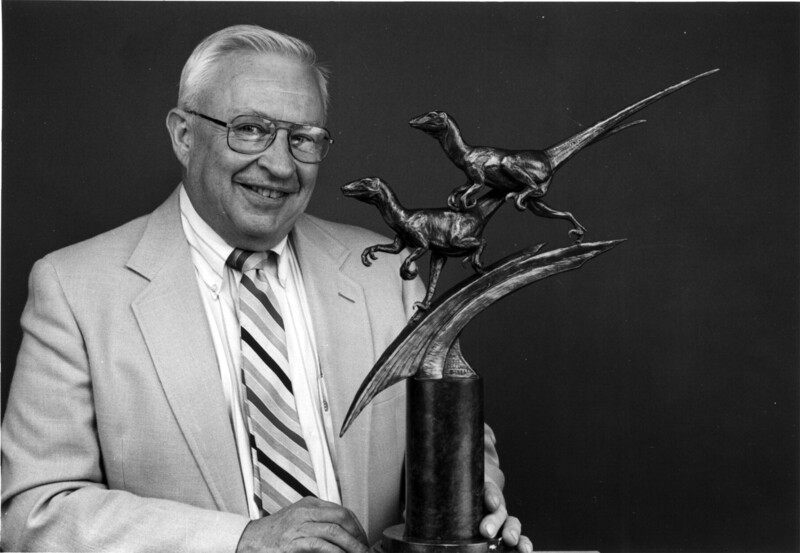 John Ostrom’s (pictured above) study of Deinonychus played an important role in changing how both Paleontologists and even the general public viewed Dinosaurs. Deinonychus showed people that Dinosaurs were not all slow, sluggish, dimwitted creatures. Deinonychus was clearly an active, intelligent creature. Ostrom also noticed several similarities between this dinosaur and modern day birds. This was not the first time a link between birds and Dinosaurs had been proposed. The first person to do so was Thomas Henry Huxley in the 19th century based on fossils of Archeoptryx the first bird. However it would be following Ostrom’s extensive study of Deinonychus that this theory began to gain more mainstream attention and now 50 years on it is universally accepted that birds are living Dinosaurs. Thus our views of them have completely changed as a result. We now no longer view them as a thing of a past. In fact there are technically more Dinosaurs than people, we also view many of them as fast, intelligent and even warm blooded creatures. Ostroms research into and study of Deinonychus has been called the most important paleontoligical dinosaur related work of the mid 20th century. Next up we shall be looking at how this Dinosaur has been represented in popular culture. I really love dromaeosaurids. Back in my childhood when my interest in dinosaurs was at its peak, the books I read had many different pictures of Deinonychus packs taking down Tenontosaurus, Iguanodon, etc – plus there were the animatronics in London’s Natural History Museum that used to be where the big T Rex is now. It’s a shame that those awesome images are now out of date because the Deinonychus don’t have feathers (and may or may not have been pack hunters). LOL I gathered you like Dromeosaurs from your name and gravitar. I’m obviously a T.Rex guy based on mine. I remember seeing the old animatronic’s of the Deinonychus’s in a Dinosaur Documentary. I must go to the Natural History museum sometime.